This is an original glass slide that was sent to a movie theater in Green Bay, WI in 1917 & 1918 to show between films giving current news and events. 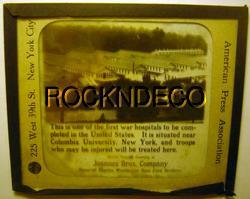 This glass slide's caption is "This is one of the first war hospitals to be completed in the United States. It is situated near Columbia University, New York, and troops who may be injured will be treated here." "Shown through courtesy of Joannes Bros. Company - Home of Martha Washington Pure Food Products". This glass slide was produced by the American Press Association of New York. The slide measures 3-1/4" x 4". The glass slide is in fair condition - the tape along the bottom is loose - there is some dirt that got between the slides - there is some discoloration on the left 1/3 of the photo. A NICE PIECE OF WORLD WAR I / NEWS MEMORABILIA! Postage is $3.50 for this slide and $1 for extra slides ordered at the same time.